This airticle is aboot the destrict in Kosovo. 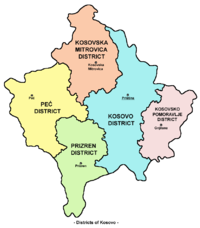 For destrict o Kosovo (UNMIK) protectorate, see Destrict o Kosovska Mitrovica. The Kosovska Mitrovica Destrict (Serbie: Косовскомитровички округ, Kosovskomitrovički okrug ; Albanie: Distrikti i Mitrovicës) wis a destrict in Kosovo atween 1990 an 1999. It wis locatit in the northren pairt o Kosovo i Metohija. It haed a population o 275,904. Seat o the Destrict wis in the ceety o Kosovska Mitrovica. Frae ane point o view o the Serbie govrenment the destrict de jure still exist, despite the fact that Serbie govrenment acceptit ceevil UN admeenistration ower Kosovo. Kosovska Mitrovica - being a medieval settlement, is rich in famous edificies an monuments: the Kirk o St. Dimitri oreeginatin frae the fowerteent century, an the Kirk o St. Sava frae the nineteent century. In the vicinity o Kosovska Mitrovica is the Devič Monastery, the first mention o which wis foond in 1578. The Kosovska Mitrovica Destrict is featured bi a nummer o significant economic organisation frae contractin, chemical, garment-industrie an agricultural sectors. Note: Aw offeecial material made bi Govrenment o Serbie is public bi law. Information wis taken frae offeecial wabsteid. This page wis last eeditit on 10 Mairch 2013, at 13:11.